Use the lines to decide whether each statement is true or false. Be prepared to explain your reasoning using the lines. A solution to $8=\text-x+10$ is 2. A solution to $2=2x+4$ is 8. A solution to $\text-x+10=2x+4$ is 8. A solution to $\text-x+10=2x+4$ is 2. There are no values of $x$ and $y$ that make $y=\text-x+10$ and $y=2x+4$ true at the same time. Match each figure to one of the systems of equations shown here. Find the solution to each system and then check that your solution is reasonable on the graph. Notice that the sliders set the values of the coefficient and the constant term in each equation. Change the sliders to the values of the coefficient and the constant term in the next pair of equations. Click on the spot where the lines intersect and a labeled point should appear. Your teacher will give you a page with 6 systems of equations. Graph each system of equations by typing each pair of the equations in the applet, one at a time. 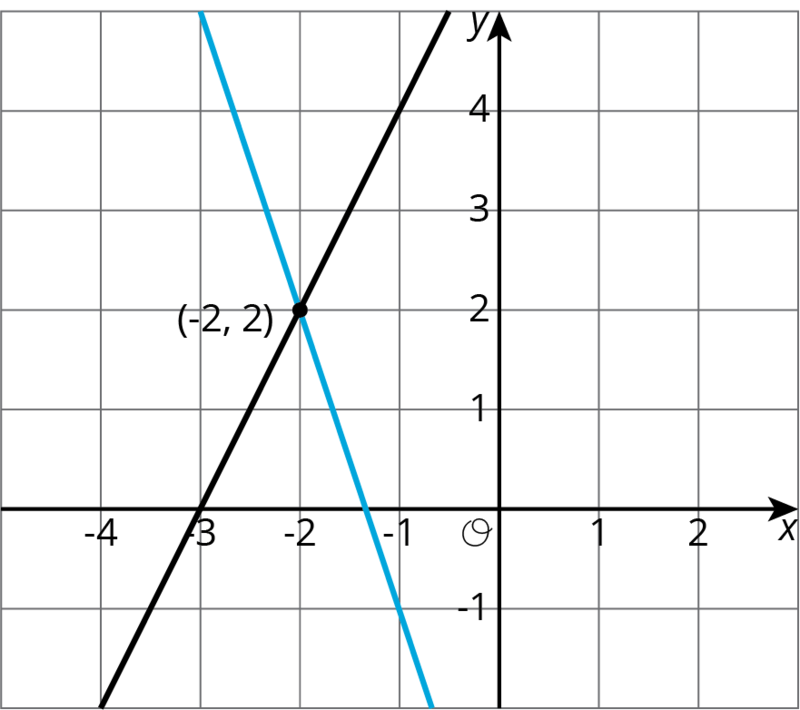 Describe what the graph of a system of equations looks like when it has . . .
Use the applet to confirm your answer to question 2. The graphs of the equations $Ax + By = 15$ and $Ax - By = 9$ intersect at $(2,1)$. Find $A$ and $B$. Show or explain your reasoning. In both cases, we find that $y = 2$. So the solution to the system is $(\text-2,2)$. We can verify this by graphing both equations in the coordinate plane. No solutions. In this case, the lines that correspond to each equation never intersect. Exactly one solution. The lines that correspond to each equation intersect in exactly one point. An infinite number of solutions. The graphs of the two equations are the same line!